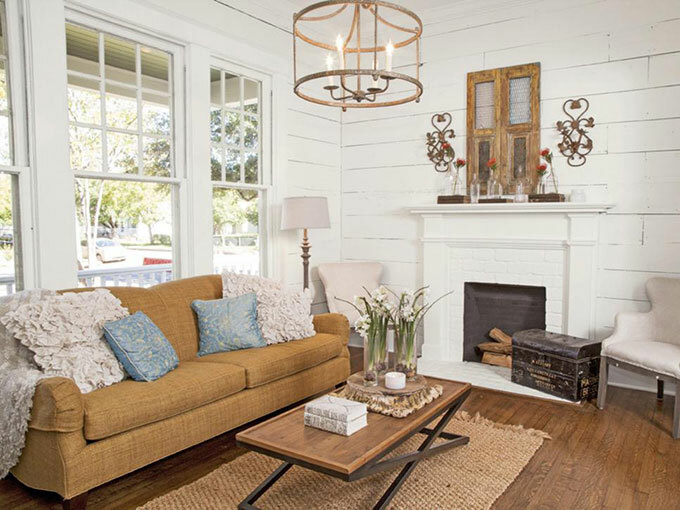 Home » Home » Is Shiplap The New Paneling? You guys, I adore the show Fixer Upper on HGTV. A. Dore. It. Don’t even get me started on how I can spend a Sunday afternoon vegging out in front of the tv watching old episodes on Netflix. Start the day off in my jammies and next thing you know it’s dinnertime and I still haven’t taken a shower. 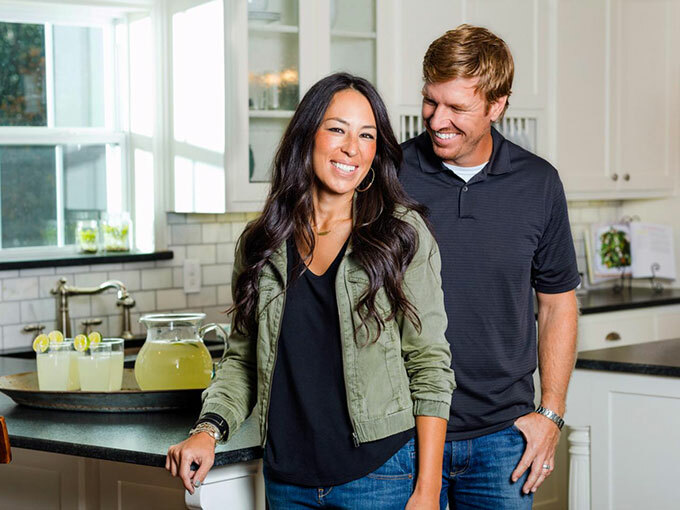 Yep, Chip and Joanna Gaines are the cause of my hygiene issues, yet they can do no wrong in my book. OK, I’m 4 sentences into this post and I just lied to you. I’m about to make blog suicide here. I just can’t do it. Not in my house. Not in my lifetime. I know, I know. It’s all the rage on their Fixer Upper program. Shiplap on walls, shiplap on fireplaces, shiplap on ceilings. Here a shiplap, there a shiplap, everywhere a shiplap lap. But seriously, you know what I see when I look at shiplap? And here’s the thing. I lived in the 70’s. I saw people go paneling crazy in their houses. No room was off limits and there were entire homes covered head to toe in the stuff. Head. To. Toe. Wood tone paneling, faux barnwood paneling, cheap laminated paneling. Even avocado colored paneling. And then, sometime in the 80’s, everyone got tired of paneling. Really really tired of it. And then had to figure out how to get rid of it. It wasn’t just nailed up there, it was glued with some sort of super human strength glue. And when you took it down it split into pieces and the plaster behind it would chunk off and you’d be left with a huge mess which cost a fortune to then fix. So whenever I see the gorgeous rooms on Fixer Upper, I ooh and ah over their kitchen renovations, their amazing transformation of the ugly and the outdated and their creative use of space. 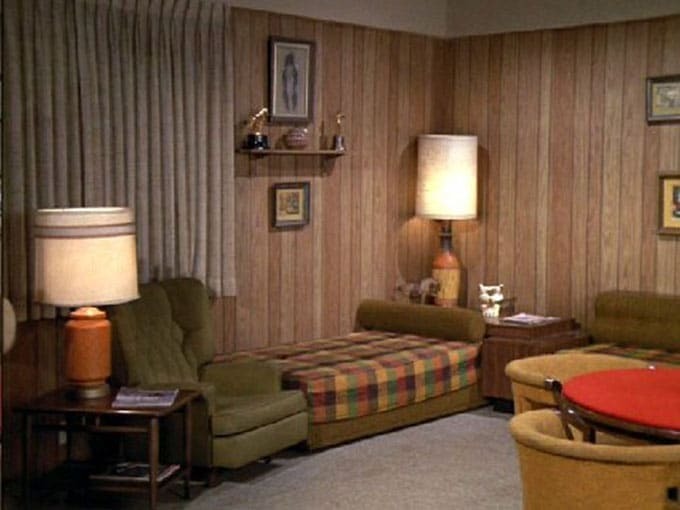 But when I see the shiplap walls, all I can picture is the Brady Bunch rec room. Or is it Joanna, Joanna, Joanna? There’s just some trends that I am too old to look at in awe and wonder and not have flashbacks to the first time they came around. Rock on Chip and Joanna, you’re still my heroes. I’m not breaking up with you or anything, but I just can’t get on board with the shiplap/paneling trend this go-round. So I’ll see you Sunday. I’ll be the one sitting on the couch with the unwashed hair. 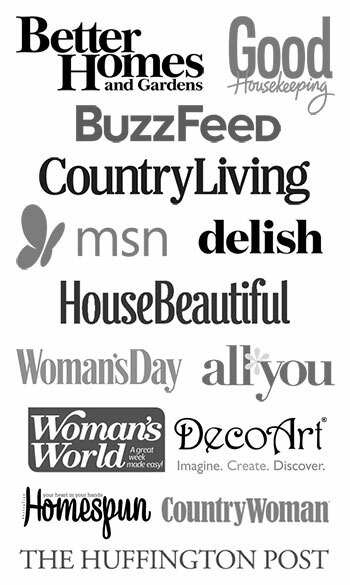 Are there any design trends that you just can’t get on board with? I wouldn’t be caught dead installing ship lap. I have too much dignity and self respect to stoop that low. To me asking that I put up ship lap is the equivalent of asking Rachel Ray to make a bologna sandwich. That also goes for galvanized sheet metal and faux beams. When I build a house it’s a house, not a faux barn. I could rant about this for an hour, but its already too draining just thinking about it. Sorry folks, but this has been a pet peeve of mine for a while now. As you can tell. I also don’t get all the chalk painted furniture. A piece here or there, especially if it’s one of those huge monster dressers from the 70’s then it’s an improvement. But painting real wood furniture with lovely grain-um no. And now people are painting upholstered chairs. No, no, no. Just no. Yes!!! I imagine sticking to it in the summer also. ps I still love the Fixer Upper too. I live in a house with paneling that I have yet to paint so although I like ship lap I have wondered aloud if in later years it would become the paneling of its time. Time will tell. I do also watch this show and I see all of those transformations but there are so few that really fit my style. Joanna is very creative but she is a very neutral everything white/gray girl and I like color. I do like it when she opens up walls and such. I think right now my biggest issue is seeing all of the “reproductions” that are IMO being passed off as antique/vintage, etc. No that is never necessarily said outloud but they visit all these “antique” store, yet a majority of the staging appears to be repros? am I wrong? I don’t have a problem with the shiplap since it is actually wood. We still have some paneling up in our living room from the 80’s. It was oak and we painted it and we still like it. One thing I can’t get on board with is wallpaper, unless it is removable. At one time every room in our house had it up…and I remember taking it DOWN. Never again. I’m not a fan of the look either but more than that, as much as I think Joanna is adorable, if I hear her say it one more time I’ll lose it! I agree with Michelle about the reproductions. I have huge heartburn with the foreign-made-to-look-like-American vintage and antique furniture/accessories. They are not hard to spot either, but I think that is because of their deal with Wayfair. I would love to see a show really use almost exclusively American antiques in a new modern way. I didn’t realize about the Wayfair connection, but now that you mention it, that must be where they are getting some of those non-authentic “antiques”. I’ve been thinking the same thing about shiplap!! I also picture 70’s paneling and how terrible it is to get rid of. My grandmother put paneling in many rooms of her early 1900’s house. What a disaster! I detest dusting and God knows there is plenty of dust in my house, but I have to wonder how grubby the rough texture of the ship lap gets over time. The chalk paint extravaganza has gone down the same path that the old faux painting did years ago. There are people who do it well and then there are those who try it based on Pinterest. Gunky texture in a mat finish that is impossible to clean and then you sand part of it off. Enough! First…I love your blog. A lot! You are a talented and funny lady. I look forward to reading your posts. We had paneling in our den growing up. One time when I was about 8 I decided to do my Mom a favor and clean the walls for her with probably that dust remover stuff. I could only reach so high and did not think of standing on a chair (or maybe I was not allowed – I don’t recall). The walls were now clean and shiny from about 3/4ths of the way down…the top 1/4 was left dirty and dull. My busy Mom left it that way for years! For a cheap ship lap look, why don’t they just take paneling pieces and turn them on their sides, install them, and paint over them? Then you could go from the 70’s to the 2010’s in a day or so. Then if the trend reverses, just take them down and put them back up the right way. Should I contact the Gaines with this information?! I was so happy to see this post! I totally agree about the ship lap craze. Suddenly everyone wants their house to look like a farmhouse. For me, the biggest trend that bothers me are the white slip covered couches that many bloggers have. No matter what anybody says, there is just no way that a white couch can stay clean for any extended period of time with kids and/or pets. Wrestling with a slipcover to wash and replace every week would be a total nightmare. I am also getting tired of seeing people tear out beautiful kitchens only to replace them with nothing but white …white cabinets, white counters, white backsplash. White can be very pretty but I love a pretty rich wood and some COLOR!! AMEN to the painting furniture that I don’t think I mentioned in my earlier response. . . I have a small antique/collectible store in Southwest Kansas and it is hard to find nice quality furniture to sell at a decent price because so much of it is being painted over. . . and I’m not talking about the pieces that are veneer based and have been repaired or the pieces that have fallen apart or are very dinged up. . . some pieces have NOTHING wrong and are being painted simply BECAUSE THEY CAN!!! I too like nice wood. I am an Oak kind of girl through and through. I love the farmhouse look but with kind of a modern twist. What I also find in so many of the homes on the show(which again I do love watching the transformations especially when I am on the treadmill) they simply look like show homes to me. My favorite episode was the one where the young couple came to them with their OWN HOUSE that had been passed down by the grandfather and they restored it for them. And while we are on the topic of Chip and Joanna. .. Did anyone see the rates for their new Magnolia House?!?!? I got an email yesterday that they were taking bookings now so I went to check it out because I thought it would be fun for a weekend getaway . . . the first weekend I checked was in November . . . $1295 PER NIGHT!!!!!!! I thought for sure it was a typo . . . nope. . . I did manage to find some nights for weekday stays that were ONLY $695. . . SERIOUSLY??? And one weekend required a 2 NIGHT STAY. INSANE! Jackie, what wood is your favorite? I am wanting to replace my old white kitchen cabinets and cannot figure out what wood I want! The struggle is real. I agree with you, Joy. I can’t see any similarities between ship lap and the 70’s paneling. It’s a whole different “species”, in my opinion. I hope Chip and Joanna never run out of houses or clients! Actually I have never seen Fixer Upper and don’t plan on it soon. I just don’t watch t.v. I had tongue and groove pine put up on some of my walls over 15 years ago and still love it, I assume it is similar to the shiplap but I don’t have it overdone. I had a 70’s modular home back in the 80’s and I painted all that paneling white, it worked just fine and no one would believe me when I said it was just painted paneling, it sure saved me a lot of time and hassle trying to rip it down. My look would include more florals but then I am a garden and flower nut. I paint them on everything aka English Cottage style. The one thing that redeems the shiplap for me is that it is reclaimed wood from the actual house and I like that idea…everything old is new again. But I agree that it can be overdone. The other trend she seems to use in every project are those oversized farmhouse dining tables. In some houses, yes, but not every single house. I so agree on the chalk painted furniture trend as well as turquoise painted anything and stripes on walls. Cheap DIY curtains hung at windows that are most often too skimpy and diy drapery hardware..yuck. Am also not a big fan of chevron anything, ceramic garden stools as end tables and sloppy gallery walls. Each one of these trends are lovely when properly done and used but most of the time it is an attempt to replicate something they saw in a magazine and just does not work. That being said, Chip and Joanna rock! Great post and provided such food for thought. We just built a new home and incorporated pine tongue and groove to a few areas-I do love it. I think there is a time and place for it, just like other design elements. I will let you know how I feel about it when it is time to clean it! So, they will be at the home show in Cleveland this March if you want to meet them. That being said, I’ve read through the comments and agree with a lot of them. What is up with the love affair of open concept? I like the thought of going into my kitchen, drinking coffee and being ALONE! Without “sight lines” so if my sink has dishes in it, it’s out of sight! My house is from 1900 so when you see the inside, it matches the outside. Also? Stainless steel is for morgue and restaurants. I love my 1941 Chambers and my fridge that I made to look like an icebox. I love breadboard. It’s truly timeless. Love your blog!! Keep in coming!!! Open Concept, that one won’t last. Sometimes you just want to walk out of the kitchen and not be reminded of the mess you left behind. And the clear glass showers..I do like a little privacy while showering. Maybe I found it so funny because you just described ME! I do like a bit here and there. I, too, am not on board with the shiplap graze. My husband and I were just saying that it was just another version of paneling, and a very rough paneling at that. It reminds me of the all the barnwood walls of the 70’s, except everyone kept them looking like old barnwood, not painted white. I also am not on board with all of the chalk paint on perfectly good furniture. So much of it that you see in the antique/thrift stores is rough to the touch. I have a hard time believing that thick paint slapped onto a diryt, un-prepped surface isgoing to last over the long haul. Shabby chic is something that I think has been done to death also. Now that I have unloaded, I too, enjoy Fixerupper. I just won’t be doing the shiplap. Hey Pam . . . quick question . . . Trends are a part of our lives every day . 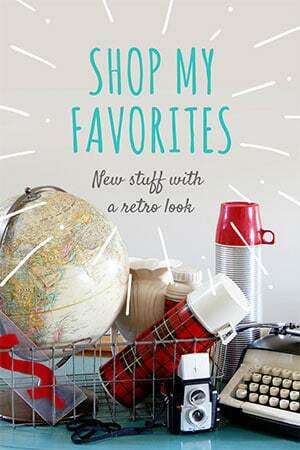 . . from our hair styles, to the clothes we wear and obviously home decor. How do you think the best way is to remodel/decorate/etc. without something dating itself too quickly and feeling the need to start over in a few years? or is that just part of the process? I just saw a windmill looking thing at Hobby Lobby the other day! It was huge, but also pretty expensive for my taste. As for decorating with trends, I tend to decorate with what I like rather than what is too trendy, so it is more a matter of me getting tired of something rather than it going out of style too quickly. I think part of it is that I have seen so many trends come and go and then come back again (not that I’m 90 years old or anything) and buying something just because it’s the HOT trend seems to be a waste of money. I think it must just be a Texas thing then. Most older homes in this part of the country (Ohio) have lath and plaster walls. The lath is thin strips of wood and then the plaster was applied over it. Or if it’s a cabin it may have wooden walls with the studs showing, but no there’s not a lot of shiplap around here unless it’s the brand new kind 🙂 Wonder if it has to do with the warmer weather down there? i like ship lap. Paneling is vertical as ship lap is horizontal. And don’t paint it! !i love the look of natural wood! Paneling IS dated but THAT can be painted. I have it in both my houses and painted it both times. Adds a bit of texture to the walls. But it’s not for everyone. My parents had in their living room in the 70’s so I hear ya on that. But ship lap is much nicer than paneling. What bothers most about those two is the need to paint every fireplace they come across. They actually ripped out a beautiful STONE fireplace once. After that I stopped watching. I agree – I also cringe when I see brick painted sometimes on the outside of the house…..can you imaging a mansion from the 1800’s and if the color wasn’t their style, they would just paint it??? Ugh, she probably would. Some of her styles are ok, but she’s too “get rid of it” for me. I believe in leaving some integrity to a home. If it’s out dated, yes, but don’t go ripping out architectural doorways or moldings. I will give her credit in that she will leave hard wood flooring if it’s in decent condition. Ok, this has turned into a gripe session about Joann and Chip. Sorry. Great post though! Pam this is a great post and good for you on sharing your opinion about shiplap. I do think it must be a Texas feature–and in homes NOT built in California. But I like the idea of using reclaimed wood and I enjoy the texture it adds to a home, especially around the here in the beach community. I’m not a fan of all the faux looks however and I think it can be overdone. And not for every house that’s for sure. Pam, I love the chemistry between Chip (adorable antics) and Joanna. Ship lap is OK if original to the home. Our house is dated 1855 but we did replace the old, smelly, moldy plaster and lathe which is Northern ship lap I think. meets vintage, add to that garden, bird decor, plaid flannel ( fan since the 70’s baby), quilts. You get the idea. ! raised 3 kids in the lovely clutter and they now admire “old” things too. Makes Mama HAPPY! My husband has wanted a windmill to display on our huge garage, but don’t consider bringing it inside buddy. Also, I have enough WHITE outside the windows now with all the snow we’ve got in Michigan! Enough already. I love shiplap. But, my issue with shiplap is that it HAS to be authentic. It is marvelous in an old Texas house but not anywhere and everywhere. It has to fit the age and style of the house and most of us just do not live in an old Texas house. I live in Texas, but I live in a neighborhood build in the 1990’s and shiplap just would not work here. And, I’m not moving just for the shiplap! I love them too, but the whole thing is a trend IMHO – “I would open up that wall, tear out the carpet, put in hardwood floors, all new kitchen cabinets, backsplash, new appliances, new light fixtures….etc…etc…etc… It all looks the same to me (sorry people) I miss shows like Decorating Cents (yup, still love it and Joan Steffand) that actually had some alternating styles. Most of FU is all the same style, which I do like, but it’s nothing different (most times). Hell, even I could do that with a team like that! I like hardwood floors, but yes, I lived thru that trend before too and I am not a floor dusting fan, especially with furry ones living in the house. I still watch them, still love them, but I crave some different shows! Im with you. Most of the decorating shows look to much the same for me. I agree , I don’t have the money and help like they do. Id like to see shows that are more realistic! You mentioned the show Decorating Cents with Joan. I really miss that type of show. Hi Judy ~ I always wonder about the people that move into the homes with none of their own items – do they move their dishes, wedding presents, mementos in later? These homes are so staged. Would’nt it be fun to see these homes after they had been lived in for a month or more? Me, too! I miss Decorating Cents! I have pretty much stopped watching HGTV at all because it all seems too unrealistic and copy-cat. The older shows (there was one other I liked a lot) were more low-key and worked within a more realistic budget- not tearing out everything. Besides Trading Spaces, what were some other good decorating shows from the 90s? My white appliances and cabinets are easy to clean with bleach water. My old wood cabinets were always gummy and disgusting. My new white sink, though, is aways stained. I don’t want to scrub and bleach every day! Will replace that with metal. I really hate those crazy bowl sinks with sluice-type faucets. and pedestal sinks with no storage. Ridiculous. And I agree- let’s see how the rooms actually look after a month or a year of normal living. I’m sure that last photo is what our family room looked like back in the 70’s. We purchased the house almost two years ago and I can’t wait to paint it…they had painted it olive green, which for them worked with their furniture. For now I am trying to decorate around the color because in the long list of things to do in this house…it’s going to be awhile before it gets tackled. 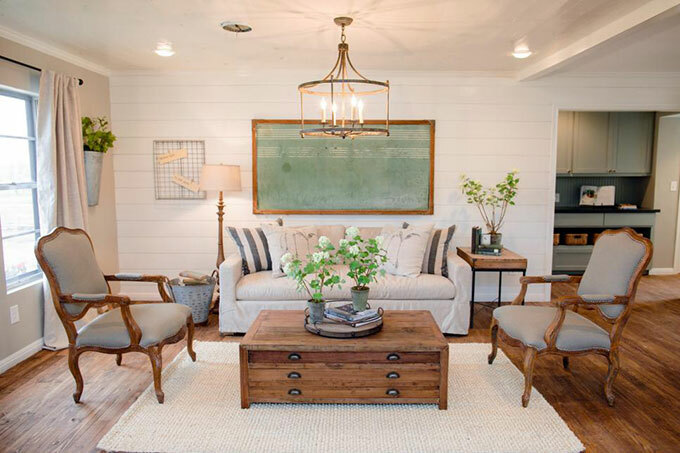 I LOVE the look of shiplap, but I wouldn’t do a whole room in it. I like it as an accent wall, but would never glue it down, because lets face it trends fade fast and you are right when you say it will be terrible to remove when you get tired of it. I can’t get used to seeing everything in white! White couch..white walls..white tables..white with beige pillows. I’m a retired nurse and it minds me of a surgery room. That’s why I love your site. I have cabinets like yours in my kitchen which I’m not spending 3 months painting them WhITE! So, thanks for keeping it real! I go to your site EVERYDAY ! OK, you got me. I have never seen baby blue paneling. I’m so jealous! I have seen the baby blue paneling! I had it in my room as a teenager. I loved it. I recently saw a commercial for Fixer Upper. Chip says “If you [Joanna] and a French door had a baby, it would be shiplap.” I’ve also seen another, but it’s difficult to describe. It’s basically Chip saying “Shiplap…Shiplap…Shiplap”. Shiplap is overly done. It’s becoming trite instead of trendy. Their own show proves it! I’ve seen a few Fixer Upper shows, and the style never changes. It’s the same colors…same “open concept”… same everything. Then Joanna is so proud of herself. It doesn’t take much to do the same thing over and over again. It’s sickeningly sweet to bring the kids in, and Chip is a big goofball. When they’re done with the house, whose house is it really? It’s so staged with stuff that doesn’t belong to the homeowners. How much do they get to keep? And if it doesn’t come from Magnolia Antiques or whatever it’s called, it comes from Wayfair or some other sponsor. It seems like Wayfair is THE HGTV sponsor, because that’s what Ellen’s Design Challenge uses, too. Probably other shows, too. The Property Brothers have a style they don’t deviate from, too. Every make-over is the same, and it gets boring. I’m done with bowls of lemons on every kitchen counter. Bowls of balls on the coffee table make no sense and have all the personality of a hotel lobby. If you need to put something there for the sake of not having an empty table, why not a pretty houseplant, or fresh flowers? Resin countertops with pennies or bottle caps may not be overdone, but they are certainly done enough. Never ever will one of these ghastly things be in my house. So glad I’m not the only one who can’t figure out the shiplap craze. It’s EVVVERYWHERE. Sorry to necra-post but I agree wholeheartedly. We should invent an easy to remove shiplap product. Thin strips could be glued to paper and go up like wallpaper. We will get rich. But then again, one of the commenters here said she would do shiplap but never wallpaper, because it is so difficult to remove. I shook my head on that one. Shiplap is going to be much more difficult to make go away than any paper. I do remember the shiplap walls in my grandmother’s house where the new upstairs was added and an outside wall became an inside wall. It was really beautiful and it fit that waterfront property perfectly. It was genuine rather than contrived. Before I do anything to my house I think about how difficult it will be to undo. How an architectural detail will age depends on the house style and how well the two fit. The shiplap will probably look better on a beach house 30 years from now than it will on most new suburban construction. Just like the 60s paneling looks great on a mid-century modern house, but it got terribly dated in my parents 40s Colonial. It is pretty now. But I would caution people to use it very sparingly like on an island, or one wall of a bathroom or bedroom like in my grandmother’s house. Wall to wall is just silly, and any fade this popular will burn bright and fade quickly. Gosh it is going to be such a mess. After reading the comments, I can pretty much assume my home would be offensive to many here. I painted my kitchen cabinets white, I faux shiplapped a wall and ceiling with drywall damage (a very economical solution to a very ugly problem), I love subway tile (something we had growing up in our bathroom) and used it liberally in both the kitchen and bath, and I am quite positive I have some of those ‘non authentic’ antiques. It seems people feel so strongly about design and decor. It’s wonderful to have an opinion, to talk of our likes and dislikes, but I always walk away from these posts feeling a bit deflated. A friend of mine actually sent me here…she teasingly said ‘hey, everyone hates your house!’ Looking at my diy curtains I can’t help but smile. I like them. That is all that is supposed to matter, right? And here I thought that women were judging me about my lack of fashion sense and really they were just hating on my pedestal sink with no storage! And BTW, I had to fight tooth and nail with both my husband and the contractor who did my son’s bathroom to get my pedestal sink in there. They both were adamant that I would not like it because it had no storage, blah blah blah. I seriously can’t tell you how much the contractor tried to talk me out of it. And, of course, they were wrong. I LOVE it!!! I agree ^^^???!!! I’m glad I’m not the only one who thinks this!! I just moved into a brand new home from a home that had painted paneling. I hated it!!!! I guess my old house is trendy again ?. I think there will be some super regretful ppl come 10 years from now. I found this blog when I googled shiplap and totally agree. I have another dilemna! The white painted cupboards in my new home. We are gutting it because they are not solid but I am not sure what to replace it with!!! The trend would tell me gray cupboards but in 10 years I am sure we are all going to be de-graying everything. I want to do wood but I am not sure what wood! My last kitchen was remodeled with modern dark wood and all the buyers wanted white. I’m not a fan of white, at all. What the heck people?! What wood?! Help! I see gray cabinets all over the place right now, but I honestly think it’s going to be a very quick trend. I sort of like the color of pecan. It’s a nice warm brown, but not as dark as cherry and not as rustic as oak. I have my own take on the farmhouse craze. I grew up in a farm house that was built in the late 1800’s. My kitchen had beadboard and wood counters and painted white cabinets. My grandmother (who lived with us) had a large cararra marble cutting board on the counter at all times. We had zebra wood paneling in the entire house. These are solid materials, authenic materials built by craftsmen. So I am naturally drawn to farmhouse style. Fast forward *cough* a few years and now its a “thing”. Now I feel like I cant have marble, or paneling or farmhouse style because its SO in, and if it’s in it will be OUT. I just bought a house with natural wood cabinets in the kitchen and as much as I love cream cabinets I might very well leave them wood colored only because everyone and their dog is painting their cabinets white. Im at a point in my life where I want things to be unique. As much as I love the look of shiplap I’d never put it on my walls because it will be the board and batten of the early 2000’s (remember that?) I’m trying not to get too sucked in to Pinterest and make my home MY own style. I cant say that I wont use any pine planks (vertically) in this new house only because I think it looks cozy and I have low ceilings, but if I do it will be knowing that in 5 years they may look dated and I’ll have to be ok with that. Very interesting! I was coming at it from a “decorating” angle, but I guess there’s also the construction aspect. Great points! Closed cell insulation. We bought an old church building that is 100% shiplap interior- stem to stern. Funny. No one is addressing all the perfectly good tile that, despise it’s great shape, is torn down in most remodels because it has become “dated”. All things come in and go out of style. No one style will be perfect for everyone. To each his own? SO MUCH YES!! I feel the exact same!! As much as I love to binge watch all the HGTV shows that have the exact same design every time (Fixer Upper, Property Brothers, and Flip or Flop being my favorites), I can’t stand the shiplap trend. I just bought my first house last year and I’m lucky there is only paneling in the dining room/kitchen. I don’t know if they randomly only put it in there or if at some point in this house’s 50 year life, someone took it out of the rest of the house. It was already painted when I got the house, so I merely painted it a different color. Shiplap is just paneling turned on its side to me. Actually, I have some shiplap in my garage, though it’s not nearly as well put-together or cute as FU makes it look. It was slapped on at some point in the past, probably when the house was built. I live very near Texas, so maybe that’s why. Other than the shiplap trend, though, I do subscribe to other “pinterest” trends. My living room is grey, as is the couch and dining room chairs, and carpet in the bedrooms. I plan on repainting the kitchen cabinets white (yes, despite what commenters here think). Currently, they’re an ugly buttermilk yellow, combined with original ugly 1964 rust brown tile backsplash. The same tile is in every bathroom too, ugh. I got it partially out of the guest bath in my remodel, but it’s still in the shower. When I rip it out, I plan on putting in subway tile (another trend!). I figure it may be a trend, but it’s also a classic and when I sell my house in a few years, someone won’t walk in and say, “ew, look at that brown tile. Gross.” I want it to be known (to potential buyers, as you do when looking at houses) as “the cute A frame house” not the “ugly kitchen” house. You don’t want to know what I nicknamed the houses I saw when looking (The “die in a fire” house, the “serial killer” house, the “pinterest” house that was dark grey and bright yellow with chevrons on the wall, etc). I guess all this rambling is just saying I don’t see the point of shiplap or trends that aren’t easily changed (don’t remind me of the wallpaper I took down in the bathroom). Paint is easy, floors, painting cabinets. All easy changes, but tearing down panelling… I’m not even going to attempt it in my house. i agree in the sense of it being used in a way that every room looks like a big collection of the same thing. however, i have seen beautiful work done by painting it different colors in different rooms of the house much like drywall and it’s an amazing difference compared to what has been normalized (everything white shiplap). i have installed the smooth version, not the raw, above wainscoting and painted it in different colors throughout a home. it really makes the home feel cohesive walking throughout, but just enough difference in color palettes of furniture and design throughout. i wish more people were creative with it, even perhaps stenciling on it, rather than just popping up white shiplap.